DoudouLinux - The computer they prefer! DoudouLinux is specially designed for children to make computer use as easy and pleasant as possible for them (and for their parents too! ), while taking care of children self-fulfillment. 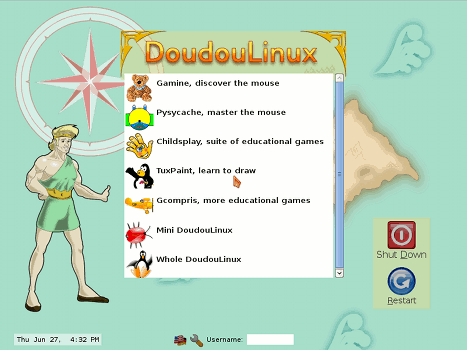 DoudouLinux provides tens of applications that suit children from 2 to 12 years old and gives them an environment as easy to use as a gaming console. Kids can learn, discover and have fun without Dad and Mum always watching! But DoudouLinux also makes it easy for Dad and Mum. Available as an autorun CDROM, DoudouLinux does not need installing. It does not touch the data in the computer it runs on, nor the system installed on the computer. Shipped with built-in content filtering, it prevents children from accidentally visiting unsavory web sites . It also preserves user privacy on the Internet, removes ads in web pages and blocks bugs, to get the best web experience. You can carry it everywhere and let children on any computer without worrying. DoudouLinux can be lent, offered, loaned, copied as often as you want. Just like they do on the school playground! This is fully legal, so DoudouLinux is really risk free from all points of view. Moreover, DoudouLinux is available in many languages so that each child will feel comfortable when he begins reading. We currently support 44 languages . More than 60 languages can be generated , but translation quality is, unfortunately, not homogeneous between languages . If you would like to help translating your language, please get in touch. Anyway, Dad and Mum will need to practice at night if they don’t want to feel too ridiculous! This functionality is still under testing for several languages such as Arabic, Romanian, Serbian and Ukrainian, as well as the demonstration languages. Arabic, Armenian, Bengali, Burmese, Chinese (China and Taiwan), Croatian, Czech, Danish, Dutch, English, Esperanto, Finnish, French, Galician, German, Greek, Hebrew, Hindi, Hungarian, Indonesian, Italian, Latvian, Lithuanian, Luxembourgian, Malay, Marathi, Norwegian (Bokmål and Nynorsk), Persian, Polish, Portuguese (Brazil and Portugal), Punjabi, Romanian, Russian, Scottish Gaelic, Serbian, Spanish, Swedish, Tajik, Telugu, Turkish and Ukrainian. DoudouLinux is already available for download in many languages, but it is possible to rebuild a DoudouLinux in even more languages. The CD translation progress can be browsed online on Transifex.